HeLe 7Pcs LEDs Slim RGBW 4 IN 1 Sound Actived Auto DM512 Magic Effect Strobe Par Stage Lights For Party Pub Home KTV Bar Disco (2PCS) by HeLe at IGWT. Hurry! Limited time offer. Offer valid only while supplies last. HeLe 7PCS LEDs RGBW 4 IN 1 Sound Actived Auto DM512 Magic Effect Strobe Par Stage Lights For Party Pub Home KTV Bar Disco（2PCS） Features: 1. 1. Strobe effects, red, green and blue white four colors change. 2. Control rotation speed, colors and strobe through automatic control or voice control. 4. High quality warranty, safe and reliable. 5. Long working life, excellent stability. Small and exquisite appearance. 6. 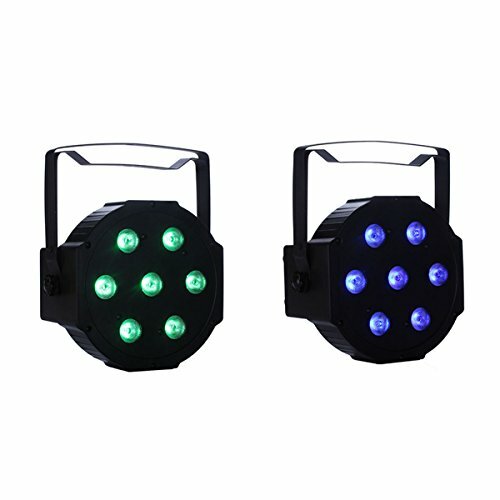 Suitable for Disco, Ballroom, Halloween, Bar, Stage, Club, Party, Wedding, Christmas etc. If you have any questions about this product by HeLe, contact us by completing and submitting the form below. If you are looking for a specif part number, please include it with your message.